Compatible with T-Mobile cell phone service, the Motorola V66 features an Internet browser, GPRS data service, two-way SMS messaging, and more--all displayed on a 96x64 pixel, backlit screen with a customizable main menu. You can even get additional bezel inserts (sold separately) to personalize your phone's appearance. The phone runs on GSM 900/1800/1900 MHz service. Used simply as a phone, the V66 features a popular, clamshell design and a host of calling features, including caller ID with time/date stamp, vibrating alert, one-touch and voice dialing, a phone book of up to 500 entries, voice message waiting, and call restrictions, as well as last numbers dialed and calls received memory. The V66's WAP 1.1-enabled microbrowser provides access to the wireless Internet for up-to-the-minute information on stock prices, news, sports, and more. You'll also enjoy basic SMS text messaging service, so you can send, receive, and store short alphanumeric text messages on your phone and with other compatible phones or PCs. There's a text-message waiting icon, and built in iTAP software provides predictive text assistance in e-mail, short messages or other edit modes. Minimal organizer features include a voice recorder, calculator with currency converter, and a clock. For fun, the V66 includes a few games--Paddleball, Blackjack, and Mindblaster--and an FM stereo radio with an integrated headset jack. I have been using V66 for 2 years. It has been the best phone I have ever had.Although I have just received a new V188 I am still using V66.I have not had any problems with this phone. It is small for pocket and easy to operate. It also has a nice loud tone which is a bliss in crowded areas. I have owned this phone for over 2 years. It has taken every kind of abuse I can imagine, including being dropped and kicked 30 yards down a concrete Chicago subway platform. This is not a fragile cell phone. I have large fingers, and have never had a problem with the size of the dialpad. I have never mistakenly dialed a wrong number. I have never jumped out of a menu by hitting the wrong button. This is not the phone to own for bells and whistles. If you primarily use your cell phone to talk, this is an excellent choice. I charge my phone perhaps every 4 days and have never had to replace the battery. I have consistently been surprised by the resilience of this phone and would not hesitate to recommend it to someone looking for a solid, single-use cell phone. This phone is almost the worst phone I have ever owned.It _is_ small,and thats its only saving grace.The simcard cover pops off regularly on both phones ive had, the hinge is flimsy and has already caused me to replace the phone once.The mic stopped working after 8 months, and reception was horrible when i used the phone open, so I had to start using it with the earpiece exclusively.That broke after another month, forcing me to get a complete replacement.Battery life headed south starting around the six month mark. Light, good battery life, easy to use and good reception! Easy to use, good keypad, clear sound, good reception. Droped 3 times, but still in great working condition! Get ready for the power of Verizon's exciting V Cast service, which allows you to download or stream full motion video and 3D games, all on your handset. A service like that requires some horsepower, and luckily, the Audiovox CDM8940 is up for the task. With support for Verizon's EV-DO high speed data network, a megapixel camera with video capture, dual color displays, and expandable memory, the CDM8940 is the perfect companion in a new era of high-speed wireless content. The phone features a traditional clamshell design with a very large 176 x 220 color display and support for a whopping 262,000 colors-- plenty of room for V Cast content. There's also 64 MB of memory built in, so you'll have plenty of space to store your videos and photos. A miniSD memory card slot is located on the left side of the phone, so you can expand available storage. A generous, full-color 128 x 96 supplementary display on the outside of the cover displays incoming call information, battery life, signal strength, graphics, photos and more. Most of the phone's features and on-screen menus are controlled by a five-way center button on the handset's backlit control pad. The CDM8940 also features a standard jack to accept universal hands-free headsets and up/down keys are located on the left side of the unit. The megapixel (1280 x 960) camera unit is housed on the rear of the unit, and USB data connectivity is available via an adapter cable. The CDM8940's built-in address book can store up to 300 contacts for quick and easy management of phone numbers and email addresses. The phone comes with built-in polyphonic ringtones plus a vibrating alert. More ringtones can be downloaded via Verizon's Get It Now service. Ringtones can be assigned to specific callers so you don't have to look at the phone to know who's calling, or you can match pictures with callers to identify them. Voice activated dialing makes calling your friends, family and associates as easy as saying their names, while a speakerphone makes it easy to talk handsfree. The CDM8940's GPS location technology pinpoints your exact location when you dial 911. With support for the EV-DO high-speed data standard, the CDM8940 is fully compatible with Verizon's V Cast service. With V Cast, you can download and stream high-quality video. Need news and weather? Get the latest Accuweather forecast delivered right to your handset, or stream CNN news headlines. ESPN sports updates, entertainment news from E!, and even Sesame Street content for the kids, are all available. V Cast also serves as a portal for enhanced 3D games. Have more fun with a new breed of realistic games. The CDM8940 has all the bases covered when it comes to messaging, with support for sending and receiving text, picture and video messages. T9 text entry, which is a technology that makes it easier for people to enter words and text on handsets, is built into the unit-- a plus for mobile email and text messaging users. Getting on the Internet anywhere is easy with the CDM8940. Verizon's Mobile Web package allows you to read and send e-mails, exchange instant messages and view your favorite web content on your phone. You can check your e-mail, trade stocks online, compare prices while shopping, access flight information, get movie listings and find directions to the theater. Verizon's Get It Now wireless download service is also fully compatible with the phone. This pay-per-download service features application downloads, games and productivity tools. You can also personalize your handset with ringtone downloads using the Get It Now service. The CDM8940 ships with a number of handy tools including a calendar and a voice memo application. An alarm clock and calculator are also included. While the CDM8940 is a great platform for watching V Cast video content, it can also capture video that can be shared with your friends and associates via video messaging. The video unit can capture clips up to 15 seconds in length. Of course, you can also use the camera to capture still pictures, too. In addition to megapixel resolution, the camera features an LED flash, macro shooting, a self-timer, and brightness and contrast controls. The phone supports V Cast 3D games, as well as other 2D-based games, which are available from Verizon's Get It Now service. You can also customize the phone's wallpapers and screensavers to give your CDM8940 a look that suits your style. Atlanta, Austin, Baltimore, Boston, Chicago, Cincinnati, Columbus, Dallas, Dayton, Houston, Jacksonville, Kansas City, Las Vegas, Los Angeles, Madison, Miami, Milwaukee, New Haven/Hartford, New Orleans, New York, Orlando, Philadelphia, Phoenix, Pittsburgh, Providence, San Diego, Tampa, W. Palm Beach, and Washington, DC. The Audiovox CDM8940 weighs 3.89 ounces and measures 3.56 x 1.82 x .92 inches. Its lithium-ion battery is rated at up to 3.5 hours of digital talk time, and up to 190 hours of digital standby time. It runs on the CDMA 800/CDMA 1900 frequencies. The phone comes with a one year limited warranty. I've had this phone and verizon for a week. Pro:Very sharp screens, Good battery life, Good reception. Cons: Speaker phone is useless. VCast isn't available yet in my area. I was a little hesitent about ordering this phone but I have not been disappointed.The camera and mp3 player are pretty good, particularly when you consider that these are bonus features of a wireless phone.RF performance seems respectable.The unit is nice and compact, the keypad and screen are very good, and the menus and displays are excellent.Navigating through the icons and setup options is very intuitive, I've hardly needed to look at the manual. The miniSD card is somewhat "crippled" but this is easy to overcome.mp3 files can be transferred to the card via a PC reader.The built-in reader of my HP OfficeJet 7310 works just fine, as the miniSD card shows up as a separate drive to which I can copy or delete files at will.The pictures are a little more work to move off the card, but a $23 Radioshack cable (part #17-760) and a free driver download will do the trick.There is a post on the Phonescoop.com forum for the CDM-8940 that explains the process in detail.Ringtones can be transferred in the same manner as pictures, I believe. The 8610, a Virgin Mobile exclusive, features a large color display, a speakerphone, support for Virgin Mobile wireless Internet services, and much more. This sporty companion keeps you in step with the latest mobile technologies at a great price. The phone features a traditional clamshell design with a large 128 x 128 color display with 65,000 colors. A monochrome 96 x 64 pixel supplementary display on the outside of the cover displays incoming call information, battery life, signal strength, graphics and more.Most of the phone's features and on-screen menus are controlled by a five-way center button on the handset's backlit control pad. Meanwhile, the top right side of the unit houses an extendable antenna while the combined charging/USB data port is housed on the unit's bottom edge. The phone also features a standard jack to accept universal hands-free headsets. Up/down keys are located on the left side of the unit for quick volume control. The 8610's built-in address book can store up to 300 entries for quick and easy management of your contacts. The phone comes with built-in Virgin Mobile "superphonic" ringtones plus a vibrating alert. Superphonic ringtones feature real music tracks and more are available via Virgin Mobile's VirginXtras service. Ringtones can be assigned to specific callers so you don't have to look at the phone to know who's calling. A built-in speakerphone lets you talk handsfree while you're on the go. The 8610 covers the messaging basics with support for sending and receiving text messages easily and quickly (Virgin Mobile text messaging charges apply). T9 text entry, which is a technology that makes it easier for people to enter words and text on handsets, is built into the unit-- a plus for mobile email and text messaging users. The phone fully supports Virgin Mobile's wireless content service, VirginXtras. Use the pay-per-use service to download superphonic ringtones from Hip Hop songs to movie themes. Get content and vote in TV-based polls via the MTV area of your phone, or get jokes and updates from Comedy Central. Pick a celebrity voice to answer your voicemail, or get a Sponge Bob thought of the day. Need to jog your memory? Use Virgin's wacky song ID service. Press the Song ID command, point your 8610 towards a song that's playing in the room, and within minutes a text message appears identifying the song's title. The 8610 ships with a number of handy tools including a calendar, a calculator and an alarm clock. The 8610 features custom Virgin Mobile graphics-- screen savers, wallpaper and menu icons-- that let you dress up your phone to suit your personality. Two pre-loaded games come with the phone, Blackjack and Magic Hexa. The Audiovox 8610 weighs 3.4 ounces and measures 3.5 x 1.90 x .90 inches. Its lithium-ion battery is rated at up to 3.0 hours of digital talk time, and up to 168 hours of digital standby time. It runs on the CDMA 1900 frequency. The phone comes with a one year limited warranty. The Virginmobile payment non-plan plan can be good for those who use a mobile phone infrequently, which I do.It could be terrible for those who use it most days. After getting used to the interface, this can be a likeable phone.If you happen to be where the signal is strong, clarity can be excellent.However, even well within the service area I have had weak signals and broken calls. That's not surprising in the building where I work.It is surprising in my apartment. The voice volume is low, even when set to level 5.It can be fine in quiet surroundings, but it's a struggle to hear in moderately noisy environments. There are no roaming fees, because there is normally no connectivity outside Sprint's digital service area.According to the manual 911 calls can connect in the roaming areas. I have not tested this. Battery life is disappointing.In standby the 1000mAH battery supplied is only good for about two days between charges.I bought the optional 1700mAH battery from Audiovox.It's twice as thick as the standard battery, and it extends standby to three days between charges. The minimal features of this phone don't bother me, but deficient signal strength, volume, and battery life make me covet a real phone from another company. Great phone, BEST COMPANY I've joined with so far. That other review above about the "warning of the customer service" is ridiculous. Once I had my phone stolen and customer service helped me through it, were quick in replying to my order for a new phone, and even paid for the minutes the thief used! It's the best customer service I've seen for any company, hands down. This phone has great features, and cool ringtones. It's a great deal for it's price and it has cool color screen backgrounds. I would give this phone the best rating possible! This phone and Virgin Mobile as a whole are obviously targeting an age group other than my own. Quite frankly, I don't care. I dropped traditional land-based phone service in February, and went with AT&T CallVantage VOIP service instead...a tremendous savings, but when the power goes out, VOIP phone service goes as well. Also, with CallVantage as of this date, 911 calls do not provide the answering call center with your phone number and location automatically. The Audiovox 8610 phone, coupled with Virgin Mobile, seemed like an inexpensive supplement to CallVantage, filling some very unpleasant gaps...and E911 service is provided. Features such as speed dial, caller ID, and even a speakerphone are included, and I'm extremely pleased with the voice quality. It's almost indistinguishable from a corded phone. For the age bracket that this phone is marketed towards, there are also two games included, and several wallpaper designs. A ton of downloadable ringtones are available at the Virgin website, provided that you don't mind spending $2.00 to $2.50 apiece for them...want to hear the "Meow Mix" ad when a call comes in? It's available for download at the Virgin website, as are ringtones involving such oddities as bodily functions, none of which will be discussed in detail here. Per minute pricing is high enough to keep me from ever using this phone other than when it is absolutely necessary (25 cents for the first 10 minutes each day, 10 cents per minute afterwards), but that's okay with me. Unexpected emergencies were the sole reason for making the purchase, and the added peace of mind that it brings more than makes up for the airtime that must be purchased from Virgin every 90 days to keep the service active...and I'm still saving money each month over traditional phone service. I would recommend the Audiovox 8610 phone and Virgin Wireless to anyone who needs a cell phone for similar reasons. Great phone.....virgin mobile service can be a little better...however, I guess that is sprint's problem. This is a great phone if your looking for the flip style, or a coloured screen, but the only problem with Virgin is ringtones cost up to $2 and the real sound ringtones are distorted. And The minutes go up like Wildfire. The Nokia 6800 with T-Mobile To Go service is the hassle-free way to stay connected. No long-term contract. No credit check. No deposits or monthly bills. Just get your phone and go! The Nokia 6800 is simply a phone made for text input. The basic looking phone hides a full QWERTY keyboard (though obviously with smaller keys than you're used to) under the numeric keypad. Just flip it up and turn the device 90¼ to use the keyboard. Its unique design is only featured on the 6800 series and offers the largest full keyboard of any consumer level mobile phone in the US. The only problem with the keyboard is that because it's quite wide, it's hard to handle with one hand. If you want to jot a text message while walking, you'll have better luck by using predictive text on the numerical keypad. While sitting down, or stationary, the keyboard is very hard to beat. It's hard to beat the Nokia 6800 keyboard's ease of use. Even though the Nokia 6800 is made for text, it does a great job at voice. Call quality is excellent and dropped calls should be few and far between. It has the standard Nokia series 40 operating system that should be familiar to users of past Nokia models. A joystick in the middle below the screen serves as the main navigation tool. When the keyboard is flipped out it makes using the joystick slightly awkward, since it's to the side of the screen. The Nokia 6800 ties in very easily with your existing email account and it even supports IMAP which is email technology that keeps email in sync across multiple devices (your phone and computer for instance). It doesn't have fully push email like a BlackBerry, but you can set email to be automatically checked at short intervals. Text and data plans from T-Mobile USA are some of the most affordable in the industry, which is a good thing since you will find yourself using these services a lot. The Nokia 6800 opens to reveal a full QWERTY keyboard under the numeric keypad. 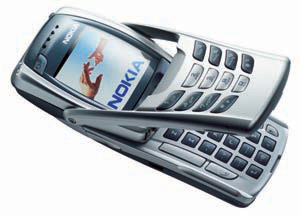 Like other phones with a built-in radio, the Nokia 6800 uses the wired handsfree unit as an antenna. This means you'll have to plug-in the handsfree before the radio will work, which is a minor inconvenience. The screen is large enough to handle most mobile web content, such as sports scores and weather information. Since the 6800 has GPRS, it downloads data at about the same speed as a dial-up internet connection. Java MIDP 1.0 support is included, so all sorts of applications can be installed. A currency converter, portfolio manager and two games come pre-installed. 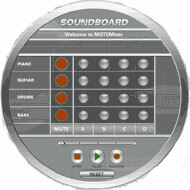 Custom ring tones can be downloaded in various formats, including MIDI. The Nokia 6800 weighs 4.3 ounces and measures4.69" x 2.17" x 0.91". It's a little longer than most phones out there, but having a full keyboard more than makes up for it. The lithium-ion battery is rated at up to 4.5 hours of talk time, and up to 10 days of standby time, but the numbers will vary depending on your usage pattern. It's a dual band GSM 800 / GSM 1900 handset. Nokia 6800 cell phone, 1000 mah Li-Ion battery, rapid travel charger, mono boom headset, SIM card. T-Mobile To Go is the hassle-free way to stay connected. No long-term contract. No credit check. No deposits or monthly bills. Compatible with T-Mobile cell phone service, the durable V60g provides you with Internet access, text messaging, high speed data download, and more, all displayed on a 4-line, backlit, 96 x 64 pixel, black and white screen. For calling, the v60g includes voice mail and a dedicated voice mail button and icon, plus call timers, redial, missed call indicator, call log, any-key answer, auto-answer, auto-redial, speed dial, mute control, no-answer transfer, one-touch 911, vibrating ring, differential ring, ringer profiles, and a phone book capacity of 500 entries. There's also 32 different ringtones and a built in ring tone composer. When you get online, you can enjoy SMS two way messaging, text messaging and text templates, and iTap predictive text assistance. High speed data download is accomplished via GPRS, and a PIM is include for getting yourself organized. Games built in to the phone include Blackjack, Mindblaster, and Paddleball. The v60g weighs 4.3 oz. and measures 4.11 x 1.81 x 0.83 inches. Its batteries are rated at 160 minutes talk time and 120 hours standby time. The Samsung RL-A760's claim to fame is its support for Sprint's Ready Link walkie-talkie feature, which makes it easy to instantly communicate with anyone on a Ready Link capable phone. When you add that to advanced voice recognition features, a speakerphone and a color screen, you've got a powerful tool for mobile productivity. The RL-A760's handsome clamshell form factor houses an internal 128 x 160, 65,000-color display. There's also a supplementary, 96 x 96 grayscale display that displays call information, battery life, time of day, signal strength and more. An extendable antenna is located on the top right side of the phone. The outside cover is dominated by a large speaker/microphone for speakerphone and voice recognition applications. Most of the phone's features and on-screen menus are controlled by a five-way center button above the handset's dial pad. The Ready Link service is operated by a button on the left side of the phone-- walkie-talkie style. A 2.5mm headset jack is also provided. The phone's built-in address book allows you to assign up to 300 entries, each storing six numbers, with a total capacity for 300 numbers and 300 email and Web addresses. A separate Ready Link phone book provides easy access to 200 personal contacts and 200 company-provided contacts. You can customize your caller ID by linking a downloaded image or photo to a specific phone number in your contact list. Choose from 29 ring tones, offering a variety of traditional ring tones as well as polyphonic (32-chord), melodic ring tones and vibrating alert. The RL-A760's GPS location technology pinpoints your exact location when you dial 911 (where available). Perhaps most importantly for users in rural areas, the RL-A760 is a tri-mode phone, meaning it can operate on Sprint's digital PCS network, as well as analog networks that serve many outlying areas. Hands-free operation of your phone is easy with the built-in speakerphone while enhanced voice recognition allows you to speak numbers digit by digit or speak the name of anyone in your phonebook. You can also command the phone to give you a status update on battery and coverage strength. Voice features are speaker-independent, so there's no need to train the phone to respond to any one person's voice. The RL-A760's Ready Link feature lets you enjoy the convenience of quick, walkie-talkie style communication at the touch of a button with one or several Ready Link users anywhere you go (Sprint PCS Ready Link service charges apply). If you need basic messaging capabilities, the RL-A760 has you covered as support is built-in for sending and receiving SMS text messages (Sprint PCS text messaging charges apply). T9 text entry, a technology that makes it easier for people to enter words and text on handsets, is built-into the unit-- a plus for text messaging users. The phone also supports PCS Vision email and instant messaging capabilities. Sprint PCS Vision transforms the wireless experience from something that's simply functional into something visual, entertaining and highly personalized. MSN Hotmail, Yahoo Mail and AOL Instant Messenger are all supported by Sprint's PCS Vision service. PCS Vision mobile Web services let you check out sports scores, get your seven-day forecast, check your flight status, and stay up to date with the latest news. Experience full-color graphic versions of popular Web sites. A number of handy software tools are bundled with the RL-A760 including a calendar, a calculator, an alarm clock and a to-do list. A voice recorder lets you record up to 10 one-minute memos for later retrieval. The RL-A760 lets you choose from a variety of pre-set images to customize your main and external displays and make them unique to you. With PCS Vision service, you can download games like Tetris and Pac-Man, as well as additional ringers, screensavers and backgrounds. The Samsung RL-A760 weighs 3.8 ounces and measures 3.5 x 1.8 x 1 inches. Its lithium-ion battery is rated at up to 3 hours of digital talk time, and up to 216 hours of digital standby time. It runs on the AMPS 800/CDMA 800/CDMA 1900 frequencies. The phone comes with a one year limited warranty. Compatible with Nextel cell phone service, the ultra-durable Motorola i530 packs all the really necessary features of a modern cell phone into the world's first weatherproof clamshell frame. This phone is so hardy, it actually meets military standard durability specs. If that's not enough, there's also Internet access, speakerphone functionality, a 600-entry phone book, voice recording, voice activation, and more. The i530's Military Standard 810 F certification means that the phone can function normally in environments with high degrees of dust, shock, and vibration. Its hard rubber encasing and interior linings and seals all work to protect the phones antenna, speaker, keys, battery door, and accessory connections. The i530 also sports tough, rubberized keys designed to be both easy to use and durable in their size and resistance to accidental depression. Used simply as a phone, the i530 sports a handy 4-way scroll key and two command keys for relatively easy navigation. It also includes a speakerphone function, important for the outdoor/industrial user, which has its own dedicated key. In its closed position, the i530's external screen lets you preview calls before you answer. The phone can also be set to connect to the last Direct Connect call or to a previously assigned Direct Connect contact, by pressing the PTT button. Other calling features include vibrating alert, downloadable voice activation (allowing users to speak a command or number and the phone will respond without a key being touched), recent calls list, call hold, call waiting, a 600-entry phone book, and keypad lock. The i530 includes basic text messaging, and its Net services include access to news, weather, entertainment, and other Mobile Net-enabled sites, as well as downloadable ring tones, and the always-handy GPS support (for non-Java services such as Mobile Locator). The i530 also provides time/date notification, an accessory connector cover that enhances the phone's durability by protecting the bottom accessory connector from dust and debris, a headset jack for direct plug-in without an adaptor, and English, French, and Spanish language settings. Nextel and Motorola have developed the ultimate "ultra cool, super sleek, power attitude, great phone w/the i530. Not only does it have consistent great sound quality on calls, but the ability to quickly contact other Nextel friends or relatives with a single push of the Direct Connect button makes other phones "just another phone". **By the way, the Direct Connect (2 way radio) is usable in FULLY PRIVATE mode by simply pressing 1 button. The speaker turns off, you hold the phone to your ear, you scroll to the name of the bud you wish to contact, you push the button to talk and release it to listen and NO ONE has to hear your fast Direct Connect conversation. All Nextel phones have the privacy button for Direct Connect. It makes voice mail such a waste of our time. That is how I use my Nextel all day at work in the office, I also keep mine on silent vibrate mode for totally discrete private use. Look at any volunteer fireman/firewoman, construction person, cop, or young Jr High/HS kid in the Westchester/Dutchess/Rockland/Putnam County, NY region: you'll see a Nextel on their belt or in their hand. It is THE PHONE where I live. Just try one. They have so many plans you will find one you like. If you are looking for a phone that can withstand dropping (twice) water, and dust, this is for you. Nice grip, classy design, I have the bumblebee version in yellow and black. Vibrate option, can use DC either as walkie-talkie or more privacy is optional by pushing a button and using DC as a phone where only you hear. Six hundred entries, web access, no color screen, but no biggie on that. Buttons solid, phone is a little larger than most phones ,but worth it . Nextel service is great.! The i530 flip phone comes equipped with today's technological demands including speakerphone, One Touch Direct Connect, Downloadable ring tones, and enable GPS functions.It is available in both yellow and black.But had ordered it off of Nextels site.They even gave me a code that saved me $50.00.Here it is for you all to share (CL897L) case sensitive.On the shopping cart page.It is like an invoice thing.But I think it is a very good choice.You will enjoy the phone. Gotta love the $200 rebate.Actually made $75 on the phone.That paid for my activation and first month's fees. Phone is great.More durable than the newer i730.My wife loves the yellow color.She can find it quickly in her purse. I called the 800 Nextel number to setup the phone once it arrived.The customer service lady was very friendly and helpful.It took only 15-20 minutes to get the phone active with a number. I ported my home land line and was told it was going to be 4-6 weeks and they gave me a temporary number.Well everything was changed over in less than a week. Incredible style meets powerful substance in this clamshell from Sony-Ericsson. With dual screens, a VGA camera with video capabilities and support for high-speed EDGE data networks, the z500a is a serious next-generation phone. It's the perfect handset for folks who want to get all the latest wireless goodies in one chic package. Click the image to get a closer look at the z500a's features. 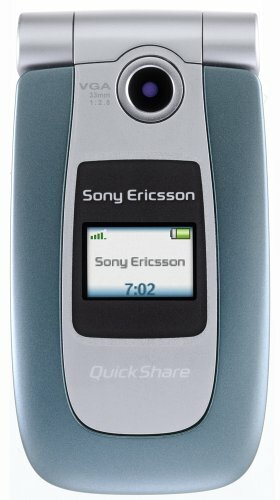 Sony-Ericsson's reputation for cutting edge design has been brought into the clamshell arena with the z500a. There's a 128 x 160 display housed under the cover while the outside sports a supplementary 96 x 32 color display that can display time, call information, battery and signal strength, and more. The VGA (640 x 480) camera is housed on the front cover as well. The z500a uses an internal antenna-- nothing to snag or break off-- and a five-way button just above the dial pad is used to control most of the phone's menus and features. Up/down buttons on the left side of the phone can be used for quick volume control and menu navigation. USB data and charging ports, as well as a headset port, are located on the phone's bottom edge. And because the z500a's front and rear faceplates are changeable with Sony-Ericsson Style-Up covers, you can dress it up to suit your style. Use the z500a's built-in ringtone composer to craft your own stylin' ringers. Get great shots and video with the VGA camera. Video capture is only limited by the amount of available memory. The z500a's phone book can hold up to 510 contacts with multiple entries per contact. A call list remembers your most recent missed, received and dialed calls. The z500a's voice activated dialing makes calling your friends, family and associates as easy as saying their names. The phone also features a speakerphone for easy, hands-free talking. In addition to a vibrating alert, the phone supports polyphonic ringtones as well as MP3 ringers, allowing you to use portions of your favorite songs to alert you to incoming calls. 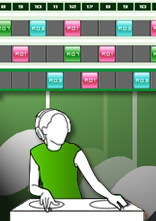 There's even a bundled application that lets you mix your own ringtones with up to 16 tracks. Meanwhile, more ringtones can be downloaded from Cingular's MEdia wireless web service. Picture caller ID lets you assign a photo to specific callers. Similarly, a ringer ID lets you assign ringtones to callers. Lastly, the phone supports Cingular's "Fast Forward" call forwarding device, which enables you to effortlessly forward your wireless calls to your land line phone. The z500a has all the bases covered when it comes to messaging. Support is built in for sending and receiving text, video, graphics and sound via messages. When used in combination with the phone's built-in camera, MMS opens up a whole new world of messaging fun. AOL Instant Messenger is also included and the phone ships with a built-in email client (Cingular messaging charges apply). The email client is preconfigured for accounts from some of the most popular ISPs, including Bellsouth.net, SBC Yahoo, and Earthlink. Getting on the Internet is easy with the z500a. It supports the GPRS protocol, as well as the new, high speed EDGE data protocol. When used with a Cingular data plan and the phone's USB data capability, the phone can be used as a wireless modem for laptops and PDAs. There's also a built-in web browser for MEdia downloads and mobile web browsing. Cingular's MEdia service lets you receive and send emails, read news headlines, get weather updates, download games and ringtones, and more. T9 text entry, a technology that makes it easier for people to enter words and text on handsets, is built into the unit-- a plus for mobile email and text messaging users. A number of handy software tools are bundled with the z500a including a voice memo recorder, a calculator, a calendar, and an alarm clock with a timer and stopwatch. Sony Ericsson Sync Station software lets you synchronize your Microsoft Outlook calendar, contacts, notes and tasks with your z500a. The z500a was designed for serious fun. 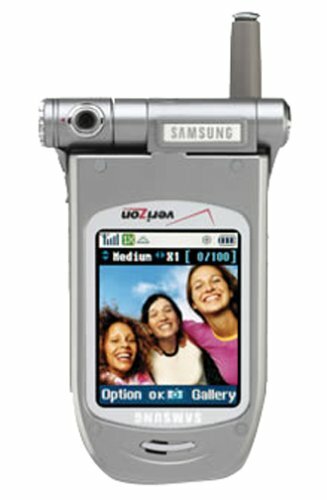 The built-in VGA camera captures stills and video to the phone's 6MB of internal memory. Video capture length is only limited by the amount of available storage memory and the phone supports playback of both MP3 audio and MPEG4 video files. Picture effects and custom screensavers, backgrounds, and themes can be set up to fit your personality. Java support is built into the z500a, making it a powerful gaming companion for both online and offline games. Games are downloadable via the MEdia service or you can use the handset's USB data connection to load more games and files onto the phone. The Sony-Ericsson z500a weighs 3.88 ounces and measures 3.66 x 1.93 x 0.94 inches. Its lithium-ion battery is rated at up to 10 hours of digital talk time, and up to 10 days of digital standby time. It runs on the GSM/GPRS 850/1800/1900 frequencies. The phone comes with a one year limited warranty. Unpleasant features and too many failures. My previous phone was a Nokia 6360 (that's old), so this z500a looked pretty nice, with two color screens, a better speaker, and a still/video camera. However, these features are forgotten when you want to carry out basic telephone functions: the buttons are recessed too deeply and feel too uncertain (there's no good, solid click) to use without carefully using a fingernail to press each button slowly, waiting to make sure that the phone processed the press. The ring volume, when I tried to change it, always seemed to have the same loud volume, whether I tried the minimum or the maximum settings. It also would have been nice to have the "Beep Once" option, where, instead of ringing, the phone lets out a very short beep, and then just vibrates. The phone is too hard to answer, too: opening the phone just a bit answers it, but if it snaps shut, it will hang up. The different settings (one is "Any Key") should do something, but I've tried them all, and it's not possible to have to press a specific button to answer the phone. The extra buttons on the outside of the phone also cause problems when trying to answer a call, interrupting normal functioning when pressed accidentally (which is all too easy). There's also no keypad lock that I've found. This phone also has problems that are bigger than simple aesthetic design features: after turning the phone off, removing and replacing the battery is sometimes necessary to turn the phone back on; the connection from the phone's power port to the cord seems tenuous at best, with the merest imperceptible touch causing the connection to flicker (making it impossible to talk on the phone while charging it), and a few other problems that are mostly related to power. This phone is hard to dial, hard to answer, and hard to transfer photos from. Granted, those first two are pretty important, but it would have been nice to get a USB connection bundled with the thing. Until I figure out a good (cheap) solution, my pictures are stuck in a phone (which, in relation to photo viewing, turns off its backlight too quickly or not at all). after a disasterous relationship with a Motorola V-180, this phone is a delight. It's relatively easy to use, but for optimum usage, you should read the manual which is fairly comprehensive and well organized. The usage of this phone is fairly intuitive to the user and will help guide you through features which is what I appreciated about Nokias and what I hated about the Motorola's. Size: clam shell design is such that when fully opened, the length rivals a real phone; which for whatever reason, i appreciate. interior display: full color. size is ok. perhaps a little small for its size. it is difficult to view outside in sunlight however. there might be a way to fix that- i need to consult the manual. Camera: this is my first camera phone, but i see nothing wrong with the quality. it does have a zoom feature. speaker is loud and clear, and comes out of the earpiece so before using it, the phone reminds you you could damage your hearing and requires you to push a button again. I'm really one for one-button operation so sometimes that does get annoying. favorite thing about the phone: has a built in recorder that makes it possible to make *anything* into a ring tone which for me makes downloading ringtones unneccessary. this is a most welcome feature as the included ringtones that are already on the phone are *terrible*. i am not exaggerating. the alert when you have a message is LOUD. and i mean LOUD. any of them. i think "click" was ok, but I haven't figured out if there's a way to dampen the volume on the alerts yet. battery life: i'm torn on this- i tend not to turn my phone off at night (it's my only phone)so a fully charged battery seems to have only 3 strong days plus for me. however, the charging is FAST. a 20 minute drive to work plugged into your car adapter will no doubt give you enough juice for an entire day. I haven't had the phone long enough to find out if that will kill the battery faster or not and i'm kind of torn as to which i'd prefer- faster charging or longer battery life. best unexpected feature: the text messaging has a dictionary. Previously, all of my phones have been from Nokia.Needless to say, I was a little nervous about switching brands.I'll begin by saying that they basic controls on this Sony Ericsson are quite a bit different, but they were extremely easy to figure out.This phone is quite a bit larger than most other flip phones out there, and it is a bit heavier.Because of its substantial size, text messaging is easier and talking is more comfortable.It's still small enough to fit in my pocket, which is a major plus. Everything on this phone is customizable.For everyone contact you can include up to five phone numbers, a picture, a special ringtone, and tons of other personal information.The factory-installed ringtones are pitiful, and Cingular ringtones are extremely overpriced.That said, anyone can easily use the sound recorder to make their own ringtones off of their stereo (or singing friends). The camera phone is sufficient.The games are only demo versions so be prepared to invest in downloading a real game if it's important to you.My favorite feature is the speakerphone, which has surprisingly clear sound quality on both ends of the call. For the price, you will not find another phone loaded with this many features.Why waste your money on a phone you'll only use for a couple of years when you can a Z500a with the same features and a smaller price tag? ill, not quite what i expected. Compatible with T-Mobile To Go service, the Motorola V300 features an Inter net browser, integrated VGA digital camera, MMS text messaging, and more, all displayed on a large, high-resolution 176 x 220 pixel, 65,000 color screen. 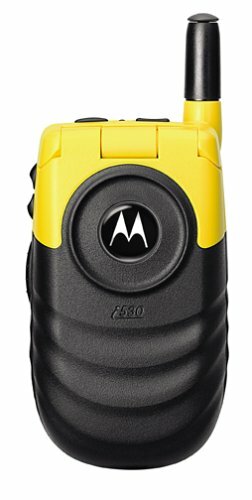 The V300's clamshell design also provides a 96 x 32 pixel, two line external screen, which displays caller ID, date, time, and various status icons (including text message waiting, voice message waiting, battery and signal strength, and voice andmessage mail, among others) without users having to open the phone. There's even a blue backlight for nighttime viewing. Used simply as a phone, the V300 features a compelling, ergonomic design and a 4-way scroll key for easy menu navigation. Primary calling features include speech recognition, which allows users to speak a pre-saved name, number, or function and the phone will call it up automatically; as well as an integrated speakerphone, auto redial notification, call forwarding, call waiting, hold, alternate line/dual name, turbo dial keys (2-9), ringer/vibrate suppress, multiple call timers, multiple key answer, vibrate mode, memory for last numbers dialed and received,and a phone book of up to 1000 entries, including Personal Information Manager (PIM) functionality with picture caller ID. The V300 has instant messaging with real-time chat. Mobile messaging features are fairly standard: via MMS, users can send, edit, forward, and receive image and text messages to and from compatible phones or PCs. Images and ring tones received via MMS can be saved in phone's handy image gallery. There's also instant messaging capability, conventional email, and built-in iTAP software, which provides predictive text assistance. The V300 supports TTY functionality for the hearing impaired. The V300's built-in Microbrowser also gives users wireless Mobile Internet access to directions, stock quotes, airline information, entertainment, and more. Users can also download MP3 polyphonic ring tones, wallpapers, and other applications and games. Two games, Bejeweled and Prince of Persia, are included with the phone. Organizer features include a 1000 contact phone book with photo caller ID, a date book, and Mobile Phone Tools compatibility, which (combined with software that is sold separately) lets users create, edit, and synchronize date book and phonebook entries with your PC. The V300 can use polyphonic Mp3s for ringtones--use one of the 21 pre-loaded sounds, or make your own with the online mixer. For fun, the V300's integrated digital camera includes zoom and brightness adjustment functions, as well as 5 MB of memory for picture storage or for saving wallpapers, screensavers, ring tones, and games downloaded from the Internet. Ringtones are supported by a 22 KHz polyphonic speaker with 24 chord capability. Users can also assign different tones for different callers saved the V300's phonebook, and for messages, faxes, and reminders. The Motorola V300's security features include call restrictions, keypad lock, phone lock, application lock, and new password capability. The phone weighs 4.3 ounces and measures3.5 x 1.93 x 1 inches. Its Lithium Ion batteries are rated at up to 390 hours talk time, and up to 200 hours standby time. This phone has great downloads and already has cool stuff on it when you buy it.it is very light and very very durable.the outside is sort of rubberized which helps you grip the phone better. this phone is also pretty small.it is a good deal. the camera is great and has good pictures in low light areas. Hot on the heels on the ubiquitous 8260, Nokia has introduced the 3360, a fun, shapely phone with several new features, including picture messaging and changeable front and back faceplates.Truly, there aren't many other phones under $100 that can match the 3360's design, components, and overallvalue. Here's the tale of the tape: the 3360 measures 4.4 by 1.9 by 0.8 inches, and it weighs 4 ounces. This means the phoneis slightly longer than a business card and weighs the same as today's ultracompact phones. It also has an internal antenna--whichpeople either love or hate--though we never had trouble with call reception. To us, everything about this phone isexecuted correctly; the keypad is well-spaced, it has salient features (even though it can't access theInternet wirelessly), and it's inconspicuous while in use. Three buttons handle most of the menu navigation: a central oval-shaped key activates the main menu and lets you selectoptions as they appear; the roller-bar navigation key scrolls through menu options; and the "C" (clear) button jumps backa step and erases text-entry mistakes. Menu choices are: Phone Book, Messages (SMS and voice-mail alerts), Call Log,Profiles (so you can choose how your phone behaves in different environments), Settings (for calls, phone, and security),Forwarding, Games, Calculator, Calendar, Composer (for DIY ring tones), and Keyguard Lock. With the backlit, five-linedisplay (three lines of text, two lines of icons and indicators), we found it easy to navigate through menus and make selections. And here's a definite design improvement on the 8260: the 3360's power button, located on top ofthe phone, is raised a bit so it's easier to use (and find). Like other phones, the 3360 has a full roster of call and messaging features. If offered by your service plan, it supportscaller ID, call waiting, SMS, voice mail, numeric paging, multiparty calling, and e-mail. Call logs maintain the last 10dialed numbers, 10 most recently received calls, and 10 missed calls. PIM functions includea clock, currency converter, calculator, calendar with room for 50 appointments and reminders, and a 250-entry phonebook. But, as we said, the 3360 offers a couple of new features (at least for Nokia phones). We logged on to AT&T Wireless's site from our PC so we could download additionalring tones. The 3360 also has eight preset images you can e-mail to your friends--but in order to take advantage of it both people need to have a 3360 that supports picture messaging. You can also download additional images from AT&T Wireless' site, provided your service plan supports this action. The front and back faceplates are separate, so you can have a two-tone phone if you desire.It was a minor challenge to remove the faceplate on the first try, but it was worth the effort. And while the phone's included gamesweren't enough to take us away from PlayStation 2, we enjoyed Space Impact (sort of Defender meets SpaceInvaders), one of the 3360's four new games. It also features Snake II, Bantumi, andPairs I. The 3360 offers five basic security features: an initial phone lock, keypad lock, call-restriction modes,and the ability to change access codes at any time. The NiMH battery is rated for up to 160 minutes of digital talk time and 7.5 days of digital standby time. In ourtests, we got the phone to hold a call for just about three hours, and it lasted for a full seven days in standby mode. We highly recommend the 3360, and we don't want to give our sample phone back. It looks different from the rest of the herd and has the features we want and need on a daily basis--all for under $100. Compatible with T-Mobile cell phone service, the Nokia 6010m is an economy phone that also happens to include quite a few nice features, such as including GPRS high-speed data download, MMS, SyncML, Java-compatibility, and voice dialing, all displayed on a 96x65 pixel, 4096-color LCD screen. Used simply as a phone, the 6010m's features include vibrating alert, custom ring tones, voice dialing and voice menu commands, and a 500-entry phone book capacity with 6 numbers per name. Nokia also supports TTY/TDD (Telecommunication Device for the Deaf), and hearing aid support for the Nokia LPS-3 Loopset (adapter and Loopset sold separately). Picture messaging and MMS capabilities built in to the 6010m enable users to send, edit, forward, and receive image, text, audio, and video messages over the wireless Internet, to and from compatible phones or PCs. You'll also get instant messaging capability, messaging templates, and predictive text assistance. Beyond messaging, the 6010m's Internet connectivity lets you access online services such as stock quotes, road directions, airline information, entertainment, and more. You can also download Java applications (version J2ME) to add additional capabilities to your phone, and high-speed data transfer and download round out the package. The 6010m provides standard organizer features including a calendar with up to 500 events, a to-do list, and more. You can also transfer this data to your PC via the included SyncML software. For fun, the 6010m customizable polyphonic ring tones, graphic displays, and screen savers, among others. You'll also get four games in addition to the Java games you can download from the Web: Backgammon, Bowling, Air Glide, and Sky Diver. Stay connected with AOL, MSN and Yahoo messaging. I had the previous model of this phone, and after about a year two of the most used keys on the keypad lost functionality (end and down).I thought they would fix that problem with this phone, but they did not.My end and down buttons you have to push down about 4x harder than any of the other buttons to work (after a year of normal use.Works fine other than that, but that will be the reason that I will have to replace it, and this time it will be something other than a nokia. for just a phone, it's pretty good. it's easy to make calls, unlike other phones where it is not very clear. green is call, red is end. simple. also, the ringtones are pretty good. i don't think you can use the ringtones where you actually hear a musical artist singing, but you can get the ringtones to play the tune of the song. there are 4 games. the phone is color. the keys are easy to use. the phone isn't too big, but it isn't so small that it's annyoing. there is instant messaging and text messaging. for just a simple phone, it's perfect. The other party can barely hear me when I put the microphone on, I tried 3 new microphones and all result in the same problem. Then I witch the phone (sent by t-mobile after they found this problem when I talked to customer service), still same problem. In conclusion, I doubt it's the defective design of microphone connection in this Nokia 6010M or the week signal of t-mobile, not a specific phone or microphone. 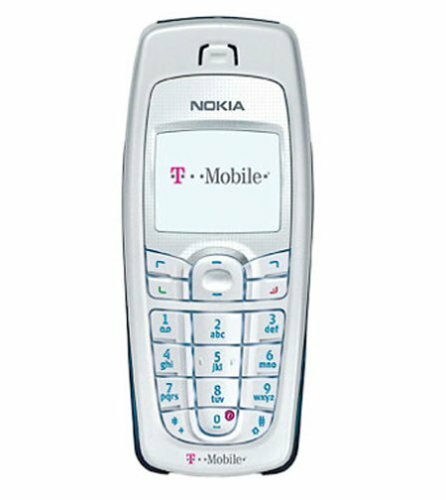 I was hoping to dump sprint, and get t-mobile service with Nokia 6010M phone. I did some experimenting while talking with my parents.During the same phone call, I'd plug in the "hands-free" earpiece/microphone, and far fewer words were garbled.Unplugged it -- garbled again.Later, I called while out-and-about in my car with 7 bars of signal strength -- very few garbled words.A few days later, was getting garbled words while talking with a battery at 4 out of 7 basrs.Plugged in the recharger, and most of the problem went away. In summary, the microphone on the Nokia 6010m phone has problems in low battery and low signal situations, making it essentially unusable in my particular location. So, I used to have fancy-pants phone, a nokia 6600 that I got from amazon for a good price after rebate, and I was really happy with it. But then it got lost, by no fault of mine, but that's a different story. Anyway, as you probably know, the deal with cell phones these days is that you either get a good deal when you first sign up for service or you end up paying an unreasonable amount of money for a phone. 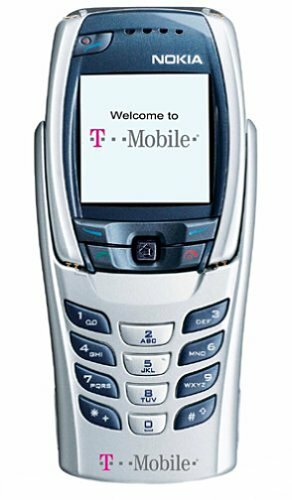 Looking around, I found that the nokia was the cheapest replacement I could get from t-mobile. That, and every other low-end phone seemed to have some sort of major design flaw that users were complaining about. So, even though I was a bit dismayed about getting a cheaper, less fancy phone, it seemed like the best option at the time. Now that I've had it for a few days, I must say that I am pretty impressed with it. It does not have all the bells and whistles, but it does do the basic phone thing well. Good clarity, good reception, small and light. It fits in the front pocket better than the 6600 ever did. The only things I don't like about it so far are the lousy included ringers (what ever happened to basic phone ringtones?) and the low rez screen. Sometimes a nice, high rez gray scale LCD is better than a low rez color, but whatever, it's not a smartphone so I won't spend a lot of time looking at the screen I guess. Oh yeah, and I wish it had a way to sync other than syncML, which I haven't figured out yet. Get ready for the power of Verizon's exciting V Cast service, which allows you to download or stream full motion video and 3D games, all on your handset. A service like that requires some horsepower, and luckily, the Samsung A890 is up for the task. With support for Verizon's EV-DO high speed data network, a swiveling megapixel camera with video capture, and dual color displays, the A890 is the perfect companion in a new era of high-speed wireless content. The phone features a traditional clamshell design with a very large 176 x 220 color display and support for a whopping 262,000 colors-- plenty of room for V Cast content. A full-color 128 x 96 supplementary display on the outside of the cover displays incoming call information, battery life, signal strength, graphics, photos and more. A speaker for the phone's speakerphone capability is placed just above this display. A swiveling camera head is integrated into the phone's hinge, allowing you to point the camera towards or away from you. Most of the phone's features and on-screen menus are controlled by a five-way center button on the handset's backlit control pad. The phone also features a standard jack to accept universal hands-free headsets and up/down keys are located on the left side of the unit. The A890's built-in address book can store up to 500 contacts for quick and easy management of phone numbers and email addresses. The phone comes with built-in polyphonic ringtones plus a vibrating alert. More ringtones can be downloaded via Verizon's Get It Now service. Ringtones can be assigned to specific callers so you don't have to look at the phone to know who's calling, or you can match pictures with callers to identify them. Voice activated dialing makes calling your friends, family and associates as easy as saying their names. Voice features are speaker-independent, so there's no need to train the phone to respond to any one person's voice. The A890's GPS location technology pinpoints your exact location when you dial 911. With support for the EV-DO high-speed data standard, the A890 is fully compatible with Verizon's V Cast service. With V Cast, you can download and stream high-quality video. Need news and weather? Get the latest Accuweather forecast delivered right to your handset, or stream CNN news headlines. ESPN sports updates, entertainment news from E!, and even Sesame Street content for the kids, are all available. V Cast also serves as a portal for enhanced 3D games. Have more fun with a new breed of realistic games. With support for sending and receiving text, picture and video messages, the A890 has all the bases covered when it comes to messaging, too. T9 text entry, which is a technology that makes it easier for people to enter words and text on handsets, is built into the unit-- a plus for mobile email and text messaging users. Getting on the Internet anywhere is easy with the A890. Verizon's Mobile Web package allows you to read and send e-mails, exchange instant messages and view your favorite web content on your phone. You can check your e-mail, trade stocks online, compare prices while shopping, access flight information, get movie listings and find directions to the theater. Verizon's Get It Now wireless download service is also fully compatible with the A890. This pay-per-download service features application downloads, games and productivity tools. You can also personalize your handset with ringtone downloads using the Get It Now service. The A890 ships with a number of handy tools including a calendar, a to-do list and a voice memo application. An alarm clock and calculator are also included. While the A890 is a great platform for watching V Cast video content, it can also capture video that can be shared with your friends and associates via video messaging. The video unit records in MPEG4 format and can capture clips up to 15 seconds in length. Of course, you can also use the camera to capture still pictures, too. And with megapixel resolution (1280 x 960), a flash and brightness controls, your shots will look better than ever. The A890 supports V Cast 3D games, as well as other 2D-based games, which are available from Verizon's Get It Now service. You can also customize the phone's wallpapers and screensavers to give your A890 a look that suits your style. The Samsung A890 weighs 4 ounces and measures 3.50 x 1.97 x .98 inches. Its lithium-ion battery is rated at up to 275 minutes of digital talk time, and up to 348 hours of digital standby time. It runs on the CDMA 800/CDMA 1900 frequencies. The phone comes with a one year limited warranty. I don't know what the guy before me is talking about with this phone...I have had NO calling problems whatsoever.I sold cell phones for years, and usually it is USER error, not the phone.This phone is far from being bad.I have had the occasional dropped call, but that is usually not the phone.Call quality is good, but not great.The phone can do a lot, my main complaint is that you can't customize the menus like you can on some other phones.I have gotten good battery life and like the ringtones you can download.Time will tell, but overall I like this phone. I don't know, and maybe it's just me, but this is the worst cell phone that I have ever owned. I waited several months for this model to come out. I should have waited a few more weeks to read reviews written by consumers. First of all, this phone does everything. It's like the Swiss Army Knife of phones. Unfortunately, the main purpose that it was designed for, BEING A PHONE, it does poorly. This phone is 100% digital. And wow, can you tell! This would be the perfect phone for Jacques Cousteau. Yes, you guessed it, half the time people sound like they are underwater. They should sell this phone at Dive Shops, right next to the flippers and air tanks. Worse still, entire words and parts thereof simply fail to be transmitted and received properly. This makes it almost impossible to carry on any kind of conversation without having to repeat entire sentences. Half the time you are trying to piece together what you heard with what you think the other person actually said. It's like doing a crossword puzzle! Oh, and forget about checking your voicemail. It seems that the sound quality of recorded phone messages just doesn't carry well and are especially difficult to understand. When I walked into the Verizon store, I asked the salesperson about the phone. He claimed that it was the best phone in the store. He said that it did everything and that it did everything well. Well, he was half right. I first purchased this phone a little over two months ago and I've had to have it replaced three times already! If that wasn't bad enough, the leather carrying case that I bought was also defective and broke within 30 days. And don't let me forget about the defective battery that came with the first replacement phone. Verizon won't refund my money and instead insists on giving me replacement phones until the problem goes away. I'm tempted to disconnect this phone and reactivate my old LG. Now that was a great phone! Buyer beware. I'd wait until the bugs are worked out of this one. With a unique flip cover that lets you view the screen while the phone is closed, a VGA camera, advanced voice dialing and speech recognition and much more, the Samsung A610 is a powerful, yet affordable, mobile companion. It's the perfect complement to Verizon Wireless service. The phone features a unique swiveling clamshell design with a large 128 x 160 pixels color display with 65,000 colors. The screen can be oriented to face outwards when you are snapping pictures, or to view caller ID pictures. Most of the phone's features and on-screen menus are controlled by a five-way center button on the handset's backlit control pad. A swiveling VGA camera (640 x 480) allows you to orient the camera to get the best shot and to point it at yourself for self-portraits. The top right side of the unit houses an antenna while the charging port is housed on the unit's bottom edge. The phone also features a standard jack to accept universal hands-free headsets. Up/down keys are located on the left side of the unit for quick volume control. The A610's built-in address book can store up to 500 contacts for quick and easy management of phone numbers and email addresses. The phone comes with built-in polyphonic ringtones plus a vibrating alert. More ringtones can be downloaded via Verizon's Get It Now service. Ringtones can be assigned to specific callers so you don't have to look at the phone to know who's calling, or you can match colorful pictures and photos with callers to identify them. The A610 features speaker-independent voice recognition, which allows any user to dial a number by speaking the name of a contact from a phone book, or by speaking the digits of a phone number. GPS location technology pinpoints your exact location when you dial 911. The A610 covers the messaging basics with support for sending and receiving text and picture messages via the MMS (Multimedia Messaging Service) protocol. When used in combination with the phone's built-in camera, MMS opens up a whole new world of messaging fun. T9 text entry, which is a technology that makes it easier for people to enter words and text on handsets, is built into the unit-- a plus for mobile email and text messaging users. Getting on the Internet anywhere is easy with the A610, as well. Verizon's optional Mobile Web package allows you to read and send e-mails, exchange instant messages and view your favorite web content on your phone. You can check your e-mail, trade stocks online, compare prices while shopping, access flight information, get movie listings and find directions to the theater. Verizon's Get It Now wireless download service is also fully compatible with the A610. This pay-per-download service features application downloads, games and productivity tools. You can also personalize your handset with ringtone downloads and digital photo-sharing tools using the Get It Now service. The A610 ships with a number of handy tools including a calendar, a to-do list and a voice memo application. An alarm clock and calculator are also included. The A610's built-in swiveling camera includes a self-timer and a flash-- great for getting good shots in low light situations. The phone also features customizable screen backgrounds so you can make your phone reflect your personality. The A610 is BREW enabled, meaning it supports games written on the BREW platform. Games are available via the Get It Now service. The Samsung A610 weighs 4.23 ounces and measures 3.50 x 1.90 x .90 inches. Its lithium-ion battery is rated at up to 4 hours of digital talk time, and up to 216 hours of digital standby time. It runs on It runs on the CDMA 800/CDMA 1900 frequencies. The phone comes with a one year limited warranty. The reasons people are giving for not liking this phone are all problems that seem to be with the provider not the phone (service in certain areas etc)! The phone is a bit larger than other phones on the market but has great battery life. While the flip around screen is cool, it is annoying after a while to have to keep flipping and such. It would be such a better phone if it had a caller ID window on the other side in addition. The camera does what it is supposed to do i suppose.. let's face it: it's a camera phone, not a nikon. All and all it's just another cell phone in my humble opinion... just a matter of personal preference. It does everything it is supposed to do. I have had no problems with it. I have had major problems with the one screw holding the flip together withe the rest of the phone.It loosens up and your flip is no longer stable you have to go get that screw tightened or do it yourself.If for some reason you don't get it tightened in a timely manner the the ribbon cable will get damaged and your phone will break in one fashion or another.I am on the third of this phone.First one lost audio, second lost the screen.Verizon refuses to do anything about my dissatisfation with this phone.They will just keep replacing this one.I have had one nice manager say he would let me void the last year of my contract so that I could buy a new phone and sign a new contract with him.Not biting.I have been with Verizon 8 years but, I am going to go to Verizon corporate, and if they can also do nothing for me I am finishing out my contract and going to another company.All this over one phone. I love this phone. I live in an area that is essentially a blackhole for wireless service & I can usually get at least 1 or 2 bars.Service inside the 'big box' type stores is hideous, though. The specific reason I chose this phone is the photo caller ID which I have found emmensely helpful & fun to play with. I find it much easier to look at a picture rather than trying to read the name & number.My only difficulty so far has been sending pix messages, but that may just be me & not the phone. The battery lasts a long time & finding my way around the phone was a fairly simple process given my track record with electronics. attractive, always 5 bar service, previous reviewer on drugs. 5 stars or 6 if were possible. I have had this phone for about 6 weeks now and I think it's great! The only thing I don't like is that you have to actually flip the phone open to see who's calling. It's small enough to fit in your pocket and you don't even know it's there! This is a nice lil' phone if you are looking for the basics. Let me first state that I do not work for any mobile provider and have used them all. Sprint is about the worst company on the face of the planet. Do not under any circumstances support this company in any way. I've reported them to the BBB for their shady practices. I had to spend a week calling them and forcing my way up the chain to talk to anyone that knew anything. It took reporting them to the BBB and writing letters to the PUC to get them to not charge me the $200 early term fee. Sprint is by FAR the worst company out there and the PUC/FCC should shut them down for illegal business practices! Please learn from my mistakes! Go to another provider. Sprint is so very evil. Please don't support them. They have horrible customer service, their phones are terrible. The reception stinks, they break easily and sprint will overcharge you. They are the worst company in the whole entire world. They are an evil empire. If I were a giant man with giant nuts, I'd teabag their whole evil empire. Compatible with Cingular cell phone service, the lightweight economy dual-band Siemens C61 runs on GSM service and includes features such as camera compatibility, EMS, Internet connectivity, almost 2 MB of data storage, and more, all displayed on a 101 x 80 pixel, 4098-color screen. For calling, you'll get call timers, redial, missed call indicator, call log, voice activated dialing, any-key answer, auto-redial, speed dial, mute control, no-answer transfer, one-touch 911, usage alert, vibrating ring, differential ring and a phone book capacity of 100 entries. Siemens also supports TTY/TDD (Telecommunication Device for the Deaf) compatibility with phone adapter (adaptor not included). Get online, and in addition to access to stock quotes, weather, movie times and more, you'll also enjoy EMS messaging, which allows you to send, receive and edit text messages with picture, audio, and even video attachments to and from your phone and other compatible phones and computers. There's also numeric paging, downloadable ring tone and graphic capability, and Java (J2ME) compatibility, so you can download Java-based software from the Web to enhance your phone's functionality and game supply. Organizer features include a calendar, calculator, and an alarm clock that works even when the phone is switched off. In addition to the included games, wallpapers, and 16-chord polyphonic ring tones, you can download more Java-based features from the Web. The phone also accepts a digital still camera attachment (sold separately), and you can even swap out the faceplate for another one if you so desire. The C61 weighs a mere 3 oz. and measures 4.33 x 1.85 x 0.91 inches. Its batteries are rated at 270 minutes talk time and up to 250 hours standby. This isn't a bad phone for the price.I had one for about a year... OK display, great battery performance (charges quick, and you can talk for hours on a single charge), good keyboard, good sound quality(for playing ring tones), decent hands-free performance, rugged construction, semi-confusing menu system. But, it doesn't come with a built-in camera - so, when my C61 met an early demise, I decided to get the newer model Siemen's CT66, which has a camera, and uses the same charger as this model (so, at least I don't have to buy all new chargers for my car, work, home, travel bag, etc.)... I had an A56 before this one, and gave it to my mom when I upgraded to this one (that's another reason why I have so many chargers). I'm partial to the Siemens non-flip design - it goes in and out of your pocket really easy... and I really like that they don't change the battery charger interface when they release new models. For the price of a fat bar tip you can now own a mobile phone that does what a mobile phone is supposed to do without the bells and whistels. You get the basic sms modes, settings, basic address book, some games and whatever else you would expect with a mobile phone that comes free with a packet of cornflakes. The battery lasts about a day if you do not use it much. To be honest 10 sms and 1 10 minute call and this phone is gasping for electricity. However it does what a mobile phone should do for a next to nothing price. If you do not use mobile phones this is one to get. 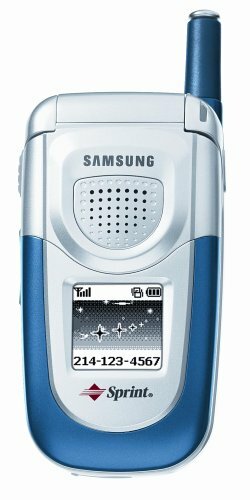 My fiance and I purchased this phone as an interim product while waiting on our Ericsson K700i's. PROS: I will have to say I am VERY impressed with the call quality and reception of this phone. I have talked to people in places other phones wouldn't even give me a signal. The CLARITY of the calls is also exceptional.The battery life is remarkable. The phonebook is easy enough to navigate. The speakerphone works well and is easily activated during a call. The buttons are laid out well despite the phones small size, but are slippery to the touch and if you have big thumbs like I do - then can be a bit tricky to navigate.CONS: The menu on the phone leaves something to be desired, I found it very difficult to navigate through to change the various options, it was not intuitive at all.The only other feature that was somewhat dissapointing was the difficulty in adjusting the volume during a call, there are no side/rocker buttons to adjust the volume, you have to interrupt the conversation and adjust it using the menu driven toggle button in the middle of the phone.Aside from missing a few features like bluetooth / pc-sync (usually only found in higher end phones) it's a great little phone for the price. I think if your looking for a solid, relatively small but not too small, light-weight and extremely reliable cell phone without a lot of bells and whistles - this is the phone for you. This review has nothing to do with this phone. I am very unhappy about their service. The item looks more like "used refurbished" than "like new" as described, but works good and came with lots of accessories. Overall great value. Thanks. The keyboard format is awesome, because I can't stand graffiti.My cover has never broken, but I would advise anyone to purchase a case for this phone.The battery isn't easily replaced, but a little googling and you'll find websites that sell replacement batteries for $25 and include instructions for installation.It's not rocket science, trust me.Otherwise, some people get their undies in a twist over the lack of voice-dialing, but I don't mind.I just use the shortcut keys for the speed dial option.It's not a great driving phone.If you're a commuter cell-phone chatterbox, this is not your phone.If you're a professional or a student with PDA experience, a little patience, and a budget, this would be perfect for you.Don't buy it new...MAJOR RIPOFF.Get it used here or on ebay. This phone is a great concept but a terrible implementation. I've owned this phone since it first came out. First, the cover breaks so easily that I had it replaced three times before my insurance provider canceld my insurance. I'll qualify this with saying that I'm an above avarage careful person and have never broken a phone before. The cover is a well documnetd issue in other reviews but this is only the least of my dislikes. For instance, the battery is built in and after a couple of months of use the average battery life goes down to about 20 minutes of talk... I do not believe that this phone is allowed to be sold as a $450 real phone and not a prototype? 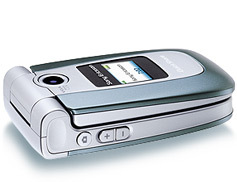 I hope the Treo 600 has gone through some phenominal improvements to rise up to an acceptable level. I've owned a Keyocera 6500 5 years ago and I loved the intelligence and careful thoughts that were put into that thing so early on in the PDA evolution days. If I have to guess, their newer PDA phones must be way better, although I have not owned it myself. I've also heard that the Samsung i500 is a hot product. Did not like it at all !!! Now here's a phone that not only gets the job done, it looks cool doing it. Featuring an external caller ID, large color display and a unique flip phone design, the SoHo/KX1 has got you covered. SoHo/KX1 features a unique asymmetric clamshell design with both internal and external displays. The internal display sports 128 x 128 resolution with support for 65,000 colors. Meanwhile, the monochrome external display shows caller ID information, as well as time, date and signal strength information. The SoHo/KX1's control pad features a five-way selection button, a number pad, and quick selection buttons. In addition, A 2.5mm headset jack is provided for hands-free talking. Optional colored faceplates are available for the phone, so you can dress it up to suit your style. SoHo/KX1's speakerphone makes it easy to converse without touching the handset-- a big plus for car users. Voice dialing supports name recognition for speedy dialing of up to 10 contacts. The SoHo/KX1's internal memory can be used to hold up to 200 contacts for quick access to email addresses and phone numbers. In addition to vibrating alerts, the phone supports polyphonic ringtones, a number of which come preloaded on the phone. More ringtones can be downloaded from Verizon's Mobile Web service. GPS location technology pinpoints your exact location when you dial 911, and perhaps most importantly for users in rural areas, the SoHo/KX1 is a tri-mode phone, meaning it can operate on Verizon's digital network, as well as analog networks that serve many outlying areas. The SoHo/KX1 is a robust mobile messaging and Internet tool. The phone's support for the enhanced messaging service (EMS) means that text, graphics and audio can be sent with ease (Verizon messaging charges apply). There's also a built-in web browser for Verizon Mobile Web downloads and mobile web browsing. Verizon's optional Mobile Web package allows you to read and send e-mails, exchange instant messages and view your favorite web content on your phone. You can check your e-mail, trade stocks online, compare prices while shopping, access flight information, get movie listings and find directions to the theater. eZiText text entry, which is a technology that makes it easier for people to enter words and text on handsets, is built into the unit-- a plus for mobile text messaging users. Verizon's Get It Now wireless download service is also fully compatible with the SoHo/KX1. This pay-per-download service features application downloads, games and productivity tools. You can also personalize your handset with ringtone downloads and digital photo-sharing tools using the Get It Now service. A number of handy software tools are bundled with the SoHo/KX1 including a calculator, a calendar and an alarm clock. The SoHo/KX1 ships with a number of wallpapers and screensavers, and more are available via the Get It Now service. The SoHo/KX1 is also BREW enabled, meaning it supports games written on the BREW platform. Games are available via the Get It Now service. The Kyocera SoHo/KX1 weighs 3.40 ounces and measures 3.46 x 1.73 x .94 inches. Its lithium-ion battery is rated at up to 3.5 hours of digital talk time, and up to 180 hours of digital standby time. It runs on the AMPS 850/CDMA 850/CDMA 1900 frequencies. The phone comes with a one year limited warranty. With a sleek design that is sure to turn heads, plus a built-in flashlight, polyphonic ringtones, a speakerphone, and more, the Nokia Shorty is one cool companion. 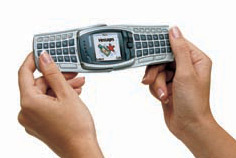 Plus, you'll get the most out of your Virgin Mobile service -- cool stuff like VirginXtras content -- with this handset. The phone features a candy bar design with a 96 x 65 monochrome display and an internal antenna. Most of the phone's features and on-screen menus are controlled by a center toggle on the control pad. You can also choose from optional, interchangeable faceplates to dress up the Shorty to match your style or mood. The Shorty's built-in address book can store up to 250 entries for quick and easy management of your contacts. The phone comes with built-in polyphonic ringtones plus a vibrating alert, while a built-in speakerphone lets you talk handsfree while you're on the go. There's even a voice dialing feature that lets you call up to 25 people by simply speaking their names. The Shorty covers the messaging basics with support for sending and receiving text messages easily and quickly (Virgin Mobile text messaging charges apply). T9 text entry, which is a technology that makes it easier for people to enter words and text on handsets, is built into the unit-- a plus for mobile email and text messaging users. The phone fully supports Virgin Mobile's wireless content service, VirginXtras. Use the pay-per-use service to download ringtones, vote in TV-based polls via the MTV area of your phone, or get jokes and updates from Comedy Central. Pick a celebrity voice to answer your voicemail, or get a Sponge Bob thought of the day. Need to jog your memory? Use Virgin's wacky song ID service. Press the Song ID command, point your Shorty towards a song that's playing in the room, and within minutes a text message appears identifying the song's title. The Shorty ships with a number of handy tools including a calendar, a calculator and an alarm clock. There's also a voice memo application for recording short notes (up to 60 seconds per note). Three pre-loaded games come with the Shorty, and more are available from the VirginXtras service. You'll also get a kick out of the phone's built-in flashlight -- great for getting in the door after nights on the town. The Nokia Shorty weighs 3.1 ounces and measures 4.03 x 1.66 x .85 inches. Its lithium-ion battery is rated at up to 4.6 hours of digital talk time, and up to 211 hours of digital standby time. It runs on the CDMA 1900 frequency. The phone comes with a one year limited warranty. Great tiny phone; just one problem. This is a tiny phone; it fits in a pocket very well. The sound quality is great, and people can hear me well. The "Shorty" is a great little phone (with the exception of the screen--it's difficult to read the time of day display). I particularly like the loudspeaker feature, which enables me to put the phone down next to me while driving and hear and be heard well.It's easy to navigate through all the features, although it might be more difficult for someone with bigger fingers; I use my thumbnail to push the buttons.Easy to find out my balance, too.I just use the phone for making and receiving calls and not for the downloadable features and games, so I haven't tried all those.The existing ringtones are I suspect aimed at a younger crowd--they sound kind of hip hop.They also sound kind of tinny.But, as I said, I'm using it mainly for a low-use phone; so this didn't discourage me. What did discourage me was the one little problem:My particular phone has a little problem of powering off on its own without warning every few days--even with a full battery charge. So I'm walking around with a phone that is not on thinking I can receive emergency calls when actually I can't, because it has spontaneously turned itself off. Nothing I do gets it to turn back on.It is just dead. I figured out I just remove the battery and put it back in (which the trouble shooting page on the nokiausa website confirmed), and this enables me to turn it back on. I find this unacceptable in a phone and am returning it. Virgin Mobile customer service was kind and polite and offered to give me a new "Shorty," but I declined, because I found the minutes disappearing too fast with the Virgin Mobile prepaid plan.I believe, because they start counting off your time the second you push send when you make a call.So, you are paying for the 15 or 20 seconds it takes your party's voice mail to connect AND the message you leave on his or her voicemail.This adds up.Had I not been unimpressed with the Virgin Mobile plan, I probably would have taken them up on the replacement offer, because I really like the phone. This is a nice, sleek looking phone from a simple pay as you go wireless provider.Virgin Mobile uses the SPRINT PCS network and charges you as follows...$.025 a minute for the first 10 minutes of the day, then $0.10 a minute after that.Or, $0.10 a minute plus $0.35 a day.You pay $0.10 per text message you send and it is free to receive them.You must top off your account at least $20 every 90 days to keep your account active, but you keep the minutes you have already purchased.If you don't use your phone a lot your looking at $6.66 a month for a cell phone.How simple is that?No other hidden fees involved. The Nokia 2115i is the smallest Nokia I have ever seen.It stands less than 4" tall, less than 1.5" from side to side and less than 3/4" thick.There are limited accessories for it at this time because it is new to the market.You can send and receive text from other phones or email addresses.There are tons of downloadable stuff from the web site as well.Other features include a speaker phone, built in flashlight, voice dialing, voice memo recording, games and more.Anytime your curious about how much money you have left in your account, you can check your balance right on the phone.It takes about 5 seconds for the account information to be zapped back to you in a text message.You can also access your account on the web site. If your like me who got tired of spending over $50 a month for cell phone minutes I never used, this is for you.I like the convenience of having a phone, but do not have a need to have it glued to my ear all day.Virgin Mobile pay as you go is simple and in my case money saving.Not to mention this particular phone is about the most stylish Nokia they make. This super compact phone is great!, It is not a sophisticated model, great for people who needs just a phone. Although it's quality is great, and has many features I didn't expect it to have such as the loudspeaker (and more things), which works great! I love the phone, it's compact I can carry it on my pockets, lightweight and doesn't look cheap; also the service at virgin is much better than tracfone, I am glad I switched, cause their phones are crap too.